There are few things more delicious than all things zucchini dessert. 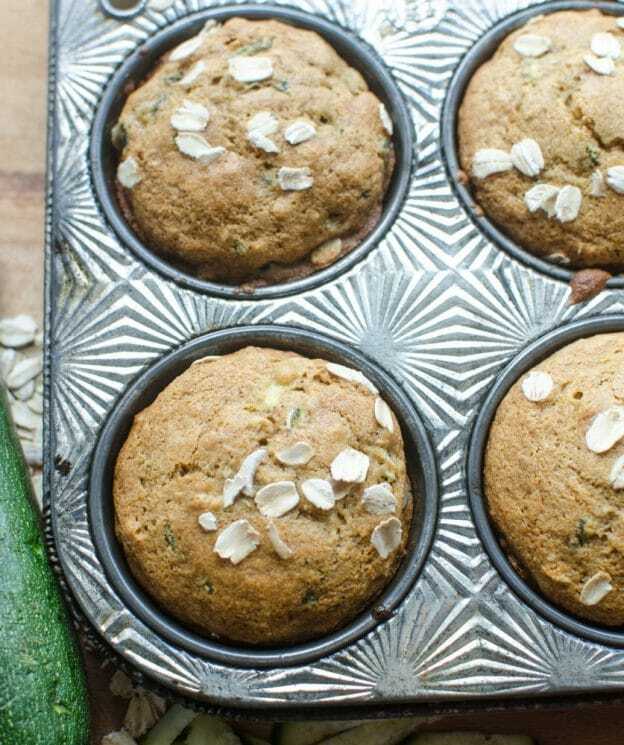 I love chocolate zucchini cake, zucchini bread, and of course zucchini muffins are always on my list to make during the summer! 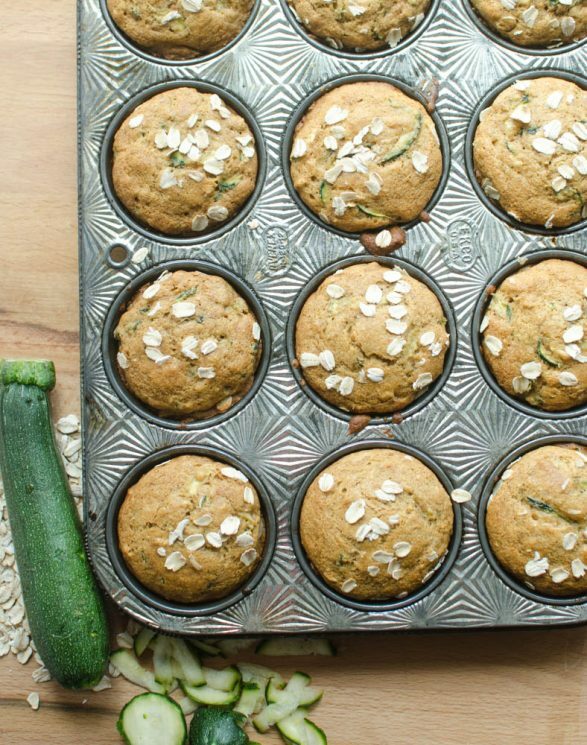 I love these simple Healthy Zucchini Oat Muffins because they are actually healthy! My kids have no idea and I’m not sad about that. We love these muffins and I make them all of the time! 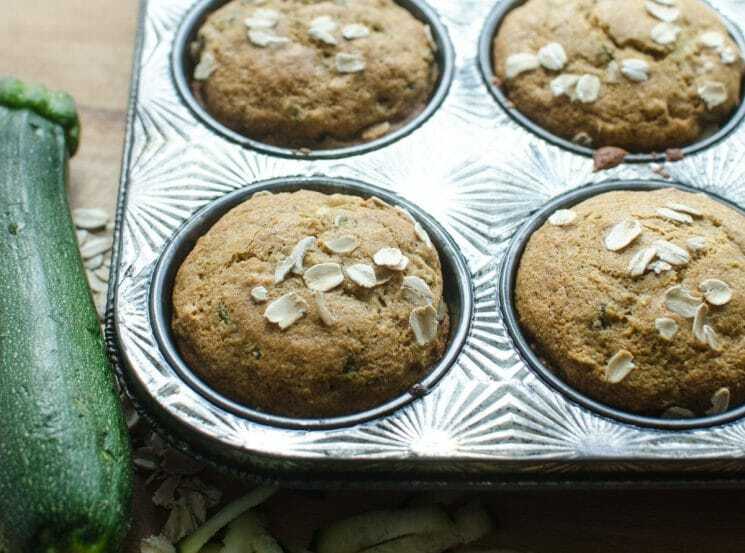 Here’s what you are going to love about them: they are made with whole grains, they are naturally sweetened, and they have vegetables in them! What’s not to love? I make these for breakfast to go with scrambled eggs, for snacks, and to serve with dinner when I’m making soup or chili. They freeze great and you can double the recipe without any issues. This is a recipe you are going to come back to again and again. When it comes to the natural sweetener I normally make these with pure maple syrup. It’s light, sweet, and there’s no indication of “maple flavor” in the end product. I have also made these many time with honey instead of maple or a mix of the two if I’m short on one. The honey muffins have a bit of a honey flavor and seem to be a bit sweeter. Use what you have, we like all of the options! 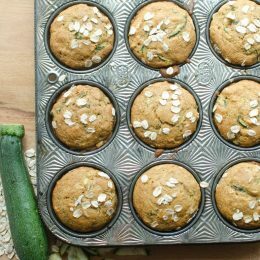 I hope you try these Healthy Zucchini Oat Muffins and make them again and again. I know their’ll become a fast favorite in your home just like they have in mine. These are great to keep a second batch in the freezer too for quick mornings. Just let the muffins cool to room temperate, stick them in a zipper-top freezer bag and freeze for up to a month. Just let them thaw at room temperature for about 40 minutes before eating. This recipes is adapted from and inspired by Gimme Some Oven. Melissa cooks, confesses, and corrals chickens and children at Bless this Mess. Here you can find healthy recipes (with some simple desserts included), a peek at her hobby farm, and the joys of raising five little ones, eight years old and younger. She’s got a whole lot of mess to bless! In a large bowl add the flour, baking powder and soda, cinnamon, and salt. Use a whisk to combine well. Make a well in the center of the dry mixture an add the egg, syrup or honey, milk, coconut oil, and vanilla. Stir until the mixture just comes together (don’t over mix). Add the zucchini and oats and stir to combine. Divide the mixture evenly between the 12 muffin cups. Sprinkle a few additional oats on eat muffin if desired. Bake for 16-20 minutes until a toothpick inserted into the center comes out clean. Remove from the oven and let the muffins cool on a wire rack for 5 minutes. Remove from the muffin pan and serve warm, at room temperature. I used one cup whole wheat flour and 1/2 cup white flour, regular maple syrup, a very rounded 1/3 cup coconut oil, and puréed my zucchini. While I combined the other ingredients, I let the zucchini drain in a fine colander over a bowl (and poured the tablespoon and a half of liquid into my smoothie). The muffins came out tasty and moist. They are not very sweet, so I’m not sure if my kids will eat them. I may add a little glaze to the tops. Thanks for the recipe. The recipe didn’t say if you should squeeze the moisture out of the zucchini. I did, and realized maybe I shouldn’t have. I ended up throwing in a snack size container of unsweetened apple sauce before adding the zucchini and oats. I’m glad I did bc they came out super moist and you can’t taste this additional ingredient at all! Would these be good if you freeze them? Just seen above you can!! Could you use normal cows milk if you don’t have almond? These were great, my kids weren’t super thrilled at first but my son has been gobbling them up. Not bad. My kids enjoyed them. 3 year old and mommy approved! I liked the idea of adding raisins too! These are AMAZING! Thank you for sharing this recipe. Easy and healthy and 4 year old approved ! Added a few tablespoons of hemp hearts, delicious! My kids love these and can’t get enough. I made them for a party and the adults loved them too. They were ok. I wouldn’t make them again. Kids didn’t like them. My 5 year old picky eater loved it!! Is there a substitute for the coconut oil? Thanks! My very picky 20 month old daughter liked them. They are lightly sweet and very filling. You can substitute coconut oil with applesauce and vegetable oil, vegetable oil, or butter. I used 2% milk instead of almond milk, and they turned out just fine. Love this recipe and how it sneakily adds in zucchini! My kids didn’t even realize it was healthy. I substituted apple sauce for the coconut oil as I didn’t have any on hand. Easy to make, easy to freeze and healthy! Thank you! Awesome Maxine, thank you for sharing! This is the best muffin I’ve ever had. seriously! 1 1/2 tsp. Added 1/8 tsp each of ground cloves and nutmeg. And 2 Tbs Stevia. I also added a chopped apple and Oh My Gosh!!! Sooo Good!!! Really moist too ? Awesome, Jori, thanks for sharing!